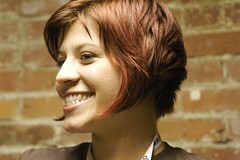 On behalf of the rest of the organizers of BarCamp Vancouver, I'd like to extend our eternal gratitude to Crystal! Without her Barcamp Vancouver would not have happened! Not only did she design and get the T shirts, she personally attended to the very many details that were required before during and after the event! Crystal rocks!